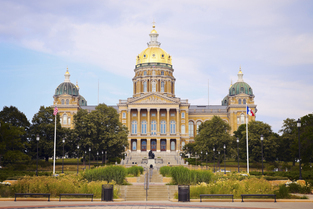 Community Bankers of Iowa Political Action Committee, originally formed in the 1970s, has been vigilant in defense of the views and needs of Independent bankers. CBI has evolved their political efforts to concentrate on issues that are of benefit to Iowa’s Community Banks and their local economies. Our ability to bring forward those issues and projects and to coordinate with other like-minded organizations, is supported by our ability to make political contributions to candidates and legislators. View the Iowa Legislative Bill Tracker. Community Bankers of Iowa has no control over information at any site hyperlinked to or from this Site. Community Bankers of Iowa makes no representation concerning and is not responsible for the quality, content, nature, or reliability of any hyperlinked site and is providing this hyperlink to you only as a convenience. The inclusion of any hyperlink does not imply any endorsement, investigation, verification or monitoring by Community Bankers of Iowa of any information in any hyperlinked site. In no event shall Community Bankers of Iowa be responsible for your use of a hyperlinked site.